Any season is good for looking for birds if you have the right mindset. Sure, in many locations spring and autumn are the highlights if all you care about are numbers. To the more rounded birder, however, any season provides opportunities to see interesting birds doing interesting things. Winter is often seen as a rather dead time of year because everything has left, especially if you live somewhere with few winter migrants. In New Zealand, however, the austral winter is not a particularly strong, due to the strong maritime influence and proximity to the equator . (Most transplanted Brits and Americans might however acidly observe that due to the New Zealand ignorance to such simple concepts as insulation, double glazing and central heating even though it isn’t sub-polar outside it certainly feels that way in the homes here.) Combined with New Zealand’s isolation this means there are not the strong seasonal shifts in birdlife here that you’d find in an equivalent area in North America or Europe. Only two of New Zealand’s landbirds are strongly migratory, both of them cuckoos. The Bronze Shining Cuckoo migrates to New Guinea and the Long-tailed Cuckoo disperses widely across the Pacific. A third species, the Welcome Swallow, is apparently partly migratory. There are more radical shifts in shorebirds, many of which leave to return to the northern tundra to breed, and seabirds, with many subantarctic species showing up around the coasts during the winter, with others leaving to spend the winter in the North Pacific. 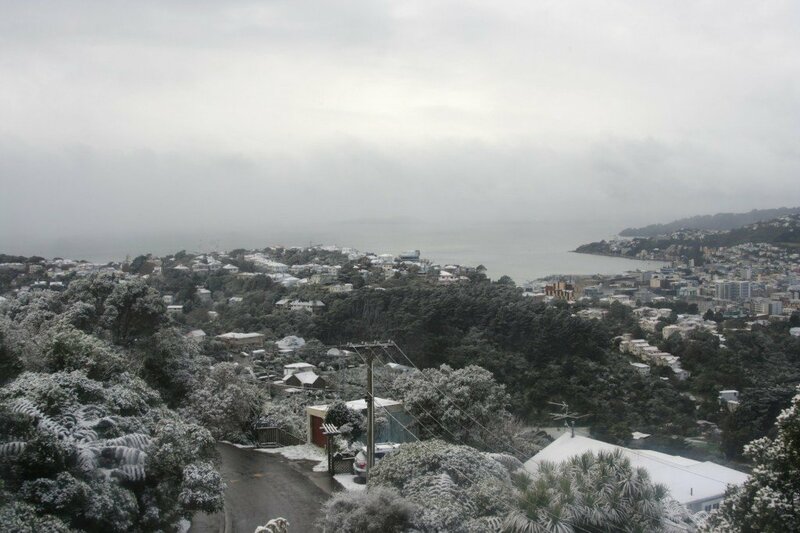 Winter did come to New Zealand this week, in an aggressive front moved up from Antarctica bringing cold weather, gale force winds and snow at sea level as high up as Auckland, in what the papers describe as a once in a lifetime event. 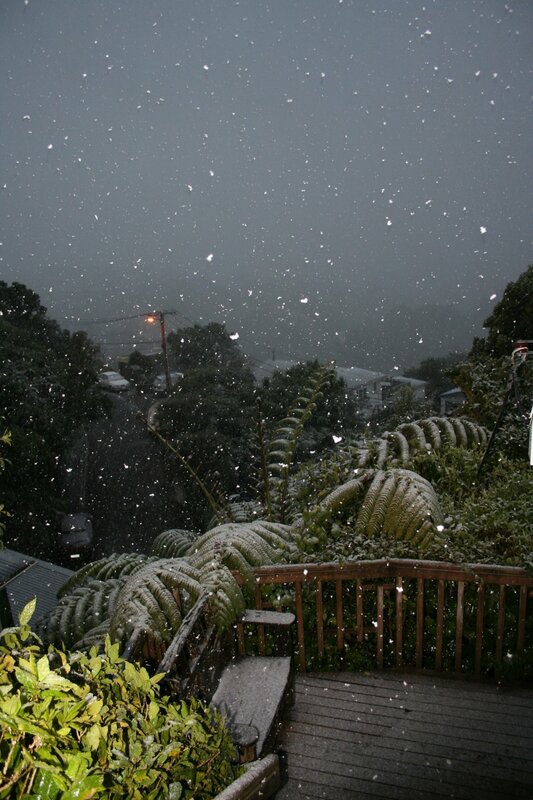 In Wellington we first saw snow late on Sunday afternoon, only the third time it has snowed here since I moved. Within twenty minutes it had started to settle, something I had never seen before. My flatmates and I quickly threw on some clothes and went to see what our neighburhood looked like in the snow. This is the same stoop on which I photographed large numbers of Kaka feeding on apples. 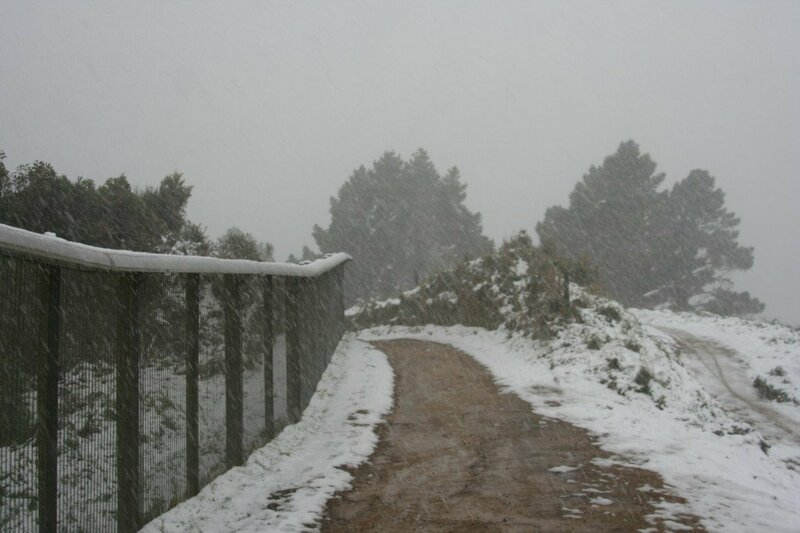 The snow stayed overnight, helped by further falls, and the following morning I went up to the path the runs along Karori Wildlife Sanctuary (or Zealandia) to see how it looked and how the birds were doing. The previous evening we had seen a New Zealand Pigeon flying past and heard a Tui proudly giving its territorial warbler as the snow fell heavily, and Tui were very much in evidence the following morning, carrying on their important business of screaming from every perch in their territory and chasing off rivals in dramatic ariel dogfights. There were also large flocks of Silvereyes, puffed up and gobbling at berries. I saw Kaka flying overhead, and heard the distant territorial calls of Saddlebacks. 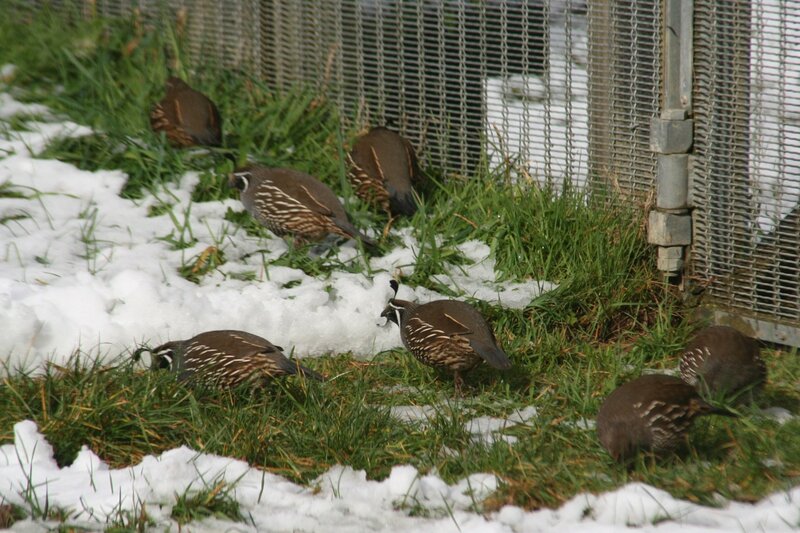 On the grass at the edge of the fence was a large group of California Quail. I climbed up the hill to have a look around but soon found myself in another strong snowfall. It felt like a blizzard but I’m sure people that get real snow would call it a flurry. The fence is the predator-fence used to keep the Karori Wildlife Sanctuary, or Zealandia, safe from mammals. The crazy weather will doubtless have an impact on the birds here, particularly insects specialists like the diminutive New Zealand Fantails. Feeding of wild birds is not as strong a traddition here as it is in England or North America, possibly because native species do not tend to be seed eaters the way wintering birds are elsewhere. Some species take fruit, but I have been told not to encourage sanctuary birds to enter my garden by staff at Zealandia due to the high numbers of cats in our area. The article I linked to above suggests that there could be a lot of bird losses because of this weather, I’ll report back when I learn more. 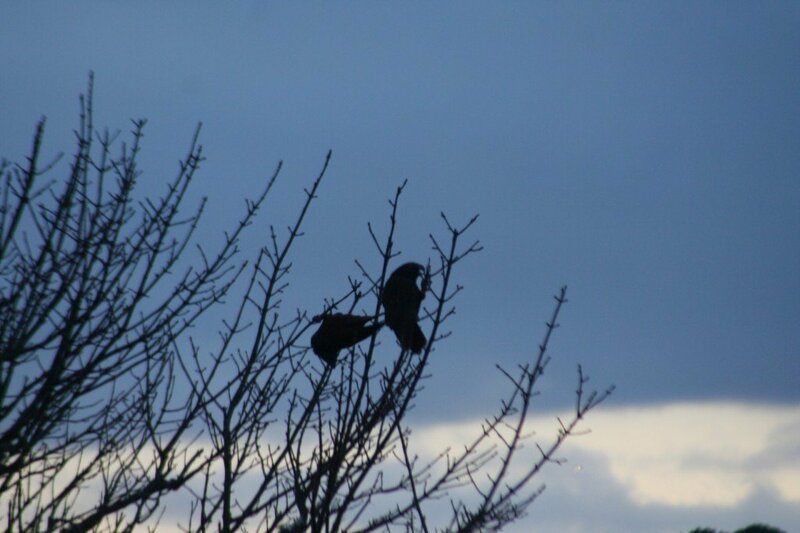 Kaka (Nestor meridionalis) feeding on tree buds at dawn on day three of the cold snap. As of Wednesday afternoon the cold front is still here but the last three days of snow is gone, now we just have rain and wind to deal with, a more usual situation. The weather should be better by Friday, so let’s hope! Brrrrrrr!! Keep warm, Duncan! We last saw California Quail on Norfolk Island. California Quail is an Oceanic game bird? That was weird to see California Quail in New Zealand! But they seem to adapt to a variety of climates and if predators are minimal, they’ll thrive. 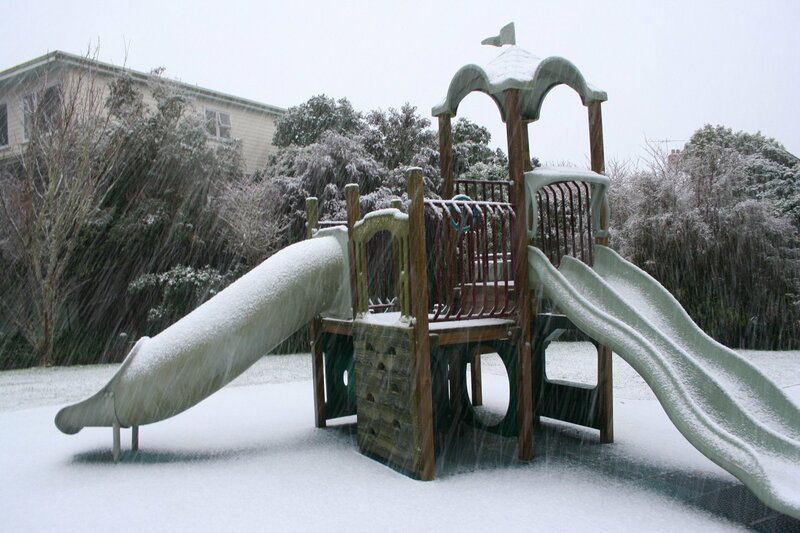 I read in the news that this was the first snow in 70+ years in some parts of New Zealand. Thanks for sharing your live and in-person update. The Quail have done quite well here, better than most introduced game birds. They’re kind of cute too, so I don’t mind them (they don’t seem to do any damage). We are moving back to Wellington from Minnesota in a few days and appreciated your post on many levels. Maybe we’ll see you birding around Karori soon!